The archipelago of the Azores consists of nine islands, located in the Atlantic Ocean, between Lisbon and New York. Sao Miguel is the largest of the islands, and Ponta Delgada, capital of the Azores, lies on this island. By Air There are several international airports in the Azores, the most important being in Ponta Delgada. There are regular services between the Azores, Europe, North America and Madeira. Interisland services are by air and sea. The climate in the Azores is mild throughout the year, and the temperatures vary from 14�C/58�F in winter to 22�C/71 �F in summer. 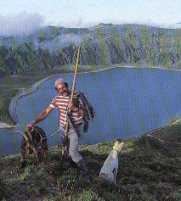 The islands of the Azores are rich in flora and fauna. The archipelago is a natural paradise due to its perfect preservation in ecological terms. There are many spectacular lakes on the islands, lying in extinct volcanic craters. In many places, springs of scalding mineral water sprout up the rocks. Dating from the times of the original settlers, there are several churches and other buildings in which Gothic elements are still present. From the golden years of the 16th and 1 7th centuries, good examples of art and religious and civil architecture in the Renaissance and Baroque styles can be found. There are museums in Ponta Delgada (Sao Miguel), Angra do Heroismo (Terceira) and Horta (Faial). origins, the sea bed is extremely interesting and there is a great variety of underwater flora and fauna. The abundance of coloured fish is breathtaking, and its many species can be seen around all the islands. There are three golf courses in the Azores, one on Terceira and the other two on Sao Miguel. Tennis, hunting and riding are also sports which can ben enjoyed here. The joy and happiness of the Azorians are expressed in their festivities, many dating back to medieval times, such as the Feasts of the Holy Spirit, which take place on all the islands. The Feast of Senhor Santo Cristo in Ponta Delgada (Sao Miguel) is a festivity of colour and happiness, as are the Sao Joaninas Festivities in Angra do Heroismo or Praia da Vitoria (Terceira), where the "touradas a corda" (a special kind of bullfight) and the "esperas de gado" (bull runnings) can be admired. The Azores gastronomy is rich and varied. One of the best dishes is the "cozido" made at the furnas on Sao Miguel. The meal is sealed and buried in iron pans to be cooked in the steam of hot sulphur springs. Also excellent is the Terceira roasted beef, as well as fish stews, shellfish, pineapple (with its unforgettable taste), and various kinds of cheese (one of which is the famous llha cheese). Well worthy of mention are the wines, especially the "vinho de cheiro" and the "verdelho". There is a good variety of handicrafts, such as wicker work, lace and embroidery, woven counterpanes, colourful ceramics, objects made from fish scales, and delicate carving from the pith of the fig tree. The Azorian archipelago can be divided into three groups. In the eastern group are the islands of Sao Miguel and Santa Maria; the central group comprehends the islands of Terceira, Graciosa, Sao Jorge, Pico and Faial; the western group comprehends the islands of Corvo and Flores. There are regular inter- island connections by sea and air. llha de S. Miguel- There is an international airport at Ponta Delgada. It is the largest island in the archipelago and is best-known for an enormous crater called the Caldeira das Sete Cidades, forming two adjacent lakes, one blue and the other green. The furnas are springs of sulphuric water surrounded by luxuriant vegetation. You can sample the famous cooking done here in the hot springs. This can be arranged through your hotel. Ponta Delgada, capital of the island, has marvellous churches, some with fabulous Baroque interiors. Also palaces from the 1 7th and 18th centuries. Other places worth visiting are the Lagoa do Fogo and the village of Ribeira Grande, which has important architectonic features. llha de Santa Maria There is also an international airport on this island. It is an island of tempting, white sandy beaches, hidden grottoes, steep cliffs and beautiful fortresses, for it was the first island to be discovered. It has excellent facilities for water sports. Worthy of note are the Mother-Church in Vila do Porto, its Town Hall installed in a 1 Gth-century convent and ancient manor houses. llha Terceira- Angra do Heroismo, capital of this island, has been classified in the list of World Heritage by UNESCO. It is a Renaissance town, with streets flanked by manor houses and churches. A special type of bullfight is held on the island. llha Graciosa- In Santa Cruz de Graciosa, you can enjoy the elegance of its ancient streets and manorial houses, the glazed tiles and gilded wood carvings of the 1 6th/18th- century Mother-Church, the 1 Sth-century Santo Cristo Church, and the Manueline Cruz da Barra. The Furna do Enxofre, with its interior lake and giant dome beneath a crater, offers interesting panoramic views. You will find the most important collection of typical Azorian windmills here. llha de Sao Jorge- The island is edged with cliffs, covered with exuberant vegetation, reaching down to the sea. Velas is the main town on the island. It is a fishing port and lies near the airport. There are manor-houses here as well as the Sao Jorge Church, with 1 7th-century paintings and the Nossa Senhora da Conceicao Church, with gilded wood carvings. llha do Pico- Pico owes its name to the volcanic peak on the island, reaching an altitude of 2,351 m. It is the highest peak on Portuguese territory and in winter is covered with snow. The island is famous for its vineyards, from where the verdelho wine is produced. Throughout the island one may find this wine in old cellars and one can admire the estate houses belonging to the wine growers. llha do Faial- Whoever visits Faial never fails to be impressed by the magnificent Caldeira, another green covered crater with magnificent views. Horta has a well-known marina, a stopping place for yachts from all parts of the world. Like other Azorian islands, Faial has magnificent hydrangea bushes scattered about the fields, and the sight of the sun going down, with Pico in the distance, is an unforgettable sight. llha das Flores- Its name means flowers, after the enormous profusion of them which cover the island. Flores is considered to be one of the prettiest islands of the archipelago, not only because of the flowers which cover even the deepest valleys, but also because of the bluish and greenish waterfalls that fall into the ocean. It is an ideal place for water sports. llha do Corvo- The smallest island in the archipelago is a sanctuary of peace and quiet. There is only one village and a few hundred inhabitants. They live according to their ancient traditions of fisherfolk and shepherds, and no one locks their doors. There are two 5-star hotels and five 4-star hotels in the Azores, with good facilities for incentives. On the islands of Sao Miguel, Terceira and Faial, there are five manor houses offering accommodation, all old, traditional houses set in lovely quintas (estates) and where the welcome is always warm.